This video is filmed at Bike rally for Russian political prisoners arranged in Helsinki Finland on 7th September. Many of the by-passers cheered when the bike rally passed by. The demonstrators ringed their bells, chanted and played drums. 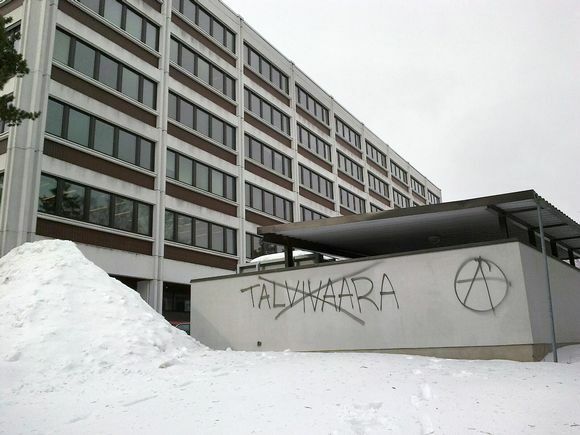 The route started from Kolmen sepän patsas and ended in the Russian embassy in Tehtaankatu, where the demonstrators cycled around the embassy and afterwards listened few speeches of the situation of the political prisoners in Russia. Mainly the demonstration rally went well and with good ambience. Sadly when rally was ending (and when the video camera stopped recording) the police suddenly attacked and arrested six demonstrators. As the world economy falters the power elite holds on to capitalism with tooth and nail, even though around them, the house of cards is wavering. The people who suffer from this listen to the money-grabbing power elite without calling into question the orders the elite hands out just to save their own hinds. The police are a model example of obedience. The decisions are made high up in the hierarchy and the people who execute these commands can not and will not put them into question. Bureaucracy will always prove too slow and rigid for life that is characterized by being fast-paced and ever-moving. 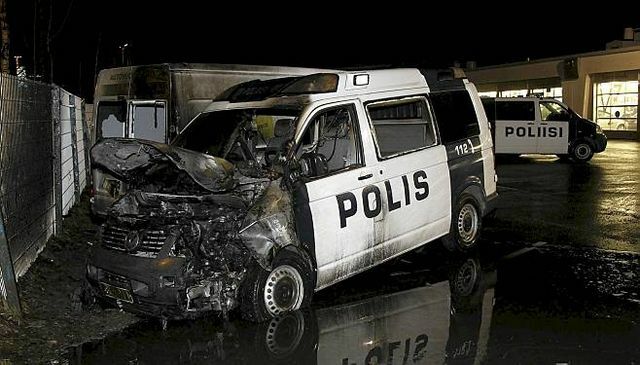 On the night of Friday the 16th of December 2011, we burned two police cars in the backyard of a Volkswagen-dealership in the Herttoniemi district in Helsinki. We torched both cars by lighting and placing a handful of lighting briquettes on the front wheels and then fled the scene. According to their communiqués the police have apprehended people in the vicinity of the dealership on the same night. It is not unheard of that the police bungle arrests without any evidence. We claim responsibility for the arson of these cars and wish to say, that no arrests will resolve this situation. Solidarity with all who are imprisoned!